As a junior, Faerber led the Sunflower League in receiving yards with 650 in 10 games, including five touchdown catches. Most of the time the division one athletes at SM East are swimmers, tennis players, or golfers--not future B1G Ten receivers. Faerber is another big-time football player in a new wave of talent at SM East working to buck the school's image of being one of the softer teams in the league. So far he's done a great job of that and he's already committed to play football at the Illinois. Last season Faerber was the primary target of Colorado bound quarterback John Schrock. It seemed like Faerber always found a way to make a the big catch when his team needed it most. Perhaps his biggest moment was his 21-yard touchdown catch in the second half against SM West that more or less gave his Lancers a comfortable lead en route to their eventual win against the Vikings (it was SM East's first win against their rival SM West in over a decade). 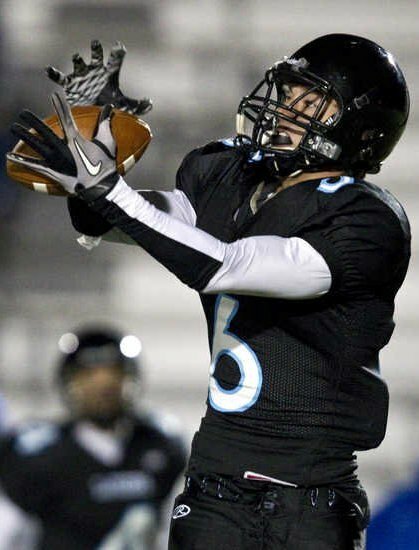 Faerber returns in 2011 as the Sunflower League's top receiver and arguably its most highly touted player. He won't have Schrock throwing to him, but with his size and ability to catch anything thrown his direction he'll make any quarterback look good. His efforts this year will go a long way in determining how well SM East is able to build off their 8-2 season from a year ago. Orange Mooney is a cancer at ON. 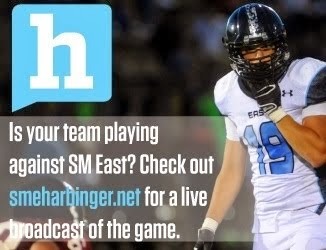 SM East already has two players in the Spotlight...must be the team to beat this year! Spotlights don't mean a team has a better chance of winning, it just raises the depression when the team falls. Raises the depression? God you are an idiot EagleSophomore. What is going on with Boomer Welsh anyone else hear he signed with Florida State? The Boomer Welsh rumor is just that. A rumor. He's been in touch with Mack Brown and already has bids from canadian football league teams. But knowing Boomer, or "Welsh Ya Gonna Do About It" as we call him, he'll likely sign with Alabama or Oklahoma. EagleSophomore, how many girls on average do you hook up with per week? Who is Boomer Welsh, never heard of him?????? I heard that Bob Stoops was in the Olathe North weight room last week talking with Orange. My cousin then saw Stoops at Smokin Joes BBQ in Olathe, across from old Dillons. There must be interest? Just like 70% of all the posts on this site, That was obviously false information. i'm not sure the poster even meant for it to be taken seriously. olathe is the proverbial skidmark in the underpants of johnson county. As good of an athlete as Faerber seems to be I bet that if SMN threw as much as SME did Perez would be the best receiver in the SL. Look up his highlight video on hudl. He is quick, has long arms, can jump, make cuts and has great hands. Obviously he plays like a champ on the other side of the ball too. Perez is a good receiver, but he has no one to throw to him. Their recent starter Kyle Goodburn graduated last year and have no one to fill his spot. Same goes for Faerber. Dakota Collins recent transfer to SME means nothing. He has a strong arm but is not accurate. He will throw a lot of pic 6's this year.